It is tradition on Rosh Hashana, the Jewish new year to eat foods that symbolises the hope we have for sweetness in the coming year. Apples are used as a reminder from the times when the Israelites were in slavery, where the giving of a apple became the symbol of hope and from the land ‘flowing with milk and honey’ we take our sweetener. 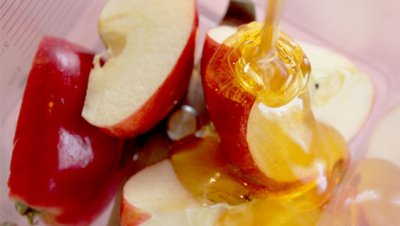 Slices of apples dipped into sweet honey has become customary as our way of wishing family and friends a happy and sweet new year…..Shana Tova V’Metuka. Other food customs to bring in the new year include making a round Challah loaf instead of the plaited bread traditional on Shabbat, symbolising the continuity of the creation in the circle of life and the pomegranate, a fruit full of seeds, is also considered to be very special to have on the table as the ‘new fruit’, full of optimism for the coming year.